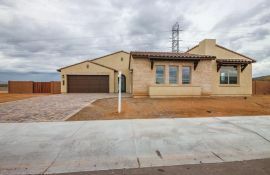 Discover the Reserves at Cantilena, a stunning desert community of luxurious homes in north Peoria. Just minutes from Lake Pleasant and the Sunrise Mountain Preserve, you’ll have endless adventures within reach by foot, bike, or paddle. Close proximity to the 101 and 303 freeways means easy access to shopping, dining, entertainment, and vibrant business centers. Add to that nearby schools and you’ve found a home that truly has it all. The Reserves at Cantilena offers a limited opportunity to own one of these desirable open-concept homes. Contemporary designs with courtyard entries and paver driveways make a stunning first impression. Gourmet kitchens with built-in appliances are a chef’s dream, while energy efficient features throughout ensure that your home is as earth-friendly as it is exquisite.